As part of the city’s Digital Strategy, the City of Vancouver is planning to build a Technology Centre in the heart of the DTES. The Technology Centre is a strategic gentrification catalyst that will put thousands of low-income housing units at risk. The Digital Strategy is on council’s agenda today, April 9th, 2013, as Homeless Dave enters his 19th day of Hunger Strike demanding housing and social justice at the former Police Station. City planners and politicians are currently proposing that the city-owned building at 312/324 Main Street be used as a Technology Incubation and Acceleration Center. The former police station building is vacant following the VPD’s move to the former Vanoc building near Boundary Road in January, 2013. Moving expenses alone cost the city $10m of taxpayer money, and yet the municipal government is considering further subsidies to incoming entrepreneurial tenants at the 300 block of Main Street. A RFEOI (“request for expression of interest”) was jointly put forward by the City of Vancouver and Vancouver Economic Commission to find an operator for the 100,000 square foot space. According to the RFEOI, the city will provide the building to the operator rent-free. In order to become financially viable, the operator will lease the space to a mix of tenants, including “pre-revenue” start-ups, social enterprises, established technology firms and potential retail firms on the first floor. According to the city’s plan, the startups and social enterprises will be provided space for “less than market rent” while the other tenants would pay market rents. The RFEOI also hints that additional subsidies will be available to the main operator of the building. Experience from other cities indicates that technological innovation centres are costly endeavors. The Canadian model for Vancouver’s Technology Centre – the MaRS project in Toronto – receives annual subsidies ranging between $30 and 40 million. In practice, the free-rent and subsidies offered to the operator amount to an ongoing public subsidy transformed into a stream of private profit as the start-ups become profit-making corporations. The proposed plan for the Vancouver Technology Centre (VTC) is based on a private-public partnership model, hinging upon the successful procurement of international venture capital and angel investors. The project would bring unprecedented amounts of capital into the neighbourhood, adding yet another layer of speculation to an already vulnerable housing stock. While the gentrifying effects of the project are undeniable, the current plan ignores any potential effects on the DTES. Thousands of SRO units already stand to be lost in the DTES if gentrification continues to scale up the rents in the area. In the 1-block radius of the Woodward’s development, 400 low-income housing units were lost as a result of redevelopment. At 312 Main Street, the number of low income housing units at risk is significantly higher. To this day, no social impact study has been undertaken to asses the impacts of past and proposed projects in the neighbourhood, despite the fact that a study has been promised by Vision for years. At a policy level, the project at 312 Main is explicitly tied to the city’s revitalization agenda for the area. The “Technology Centre” is already seen as an extension of the city’s “burgeoning entrepreneurial playground” of Railtown and Gastown, and the RFEOI states: “the centre can act as a catalyst or hub for…an innovation zone or neighborhood.” In Toronto, the MaRS project became the center of the rapidly expanding Discovery District and is currently is in its second phase of construction. The VTC projects comes at a time when corporations and small businesses continue to leave the city due to unaffordable rents. Vancouver has now been dubbed “Canada’s most expensive office market,” yet Vision’s solution to the affordability crisis is merely to pass emergency measures on an ad hoc basis, strategically targeted towards high profile firms and projects, like London Drugs, the six sites, and the VTC. The truth is difficult to avoid: a systemic crisis of lost jobs and lost housing is being papered over with private deals and subsidies for a select number of elite players. Most recently, city hall approved a lease-to-own agreement with Hootsuite for another police building on Main Street. The lease for the former police station at Main and 8th was approved at a secret “in camera” meeting in June 2012. FOI documents turned over to journalist Sam Reynolds are heavily redacted but reveal that the city allocated $4.55 million of taxpayer money from the Capital Financing Fund for building improvements. These are millions of dollars that will be directly and solely reaped by Hootsuite. Every day more housing and employment is lost in the real-estate affordability crisis, yet Vision Vancouver continues to subscribe to radical free-market ideology, refusing to take any measures to control the real-estate market or cut into real-estate profits whatsoever. The main reason for the growing demand for space for technology start ups is the lack of affordable spaces in the city. When Vancouver Economic Commission states that “affordable space for growth” is important, their solutions come at the expense of affordable housing. The patchwork initiatives of our municipal government continue to facilitate the developer monopoly while subsidizing a small number of catchy projects conducive to creative class optics. The proposed “Vancouver Technology Centre” is an integral part of the city’s Digital Strategy, which is on the Council Meeting agenda today (April 9th). The meeting coincides with the 19th day of Homeless Dave’s Hunger Strike against gentrification. 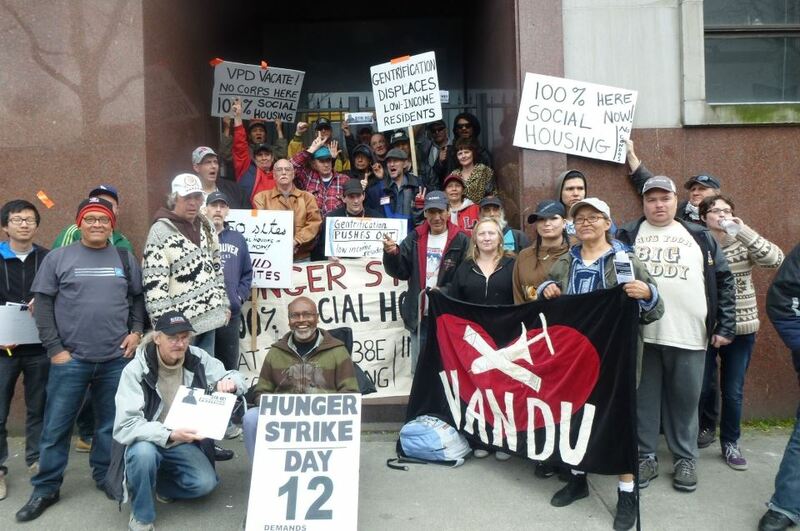 One of Dave’s three demands is to build Social Housing at the former cop-shop at 312 Main Street, “with a community-directed space focused on women and aboriginal people in recognition of the horrific damage done over the years by the Vancouver police at the site.” The demand could not be more timely. Residents have organized the Paint Party for Housing on Sunday April 14th, noon at 312 Main Street. Posted in Downtown Eastside, Gentrification, Housing, Uncategorized. Bookmark the permalink. I’m concerned about the so called “community investment” of my membership $’s being redirected by VanCity towards this project that obviously further gentrifies the DTES. My VanCity Credit Union should know Better! To all VanCity members, let this be an issue at the May 7th/13 AGM! VanCity should only be supporting the increase of Housing @ welfare rates in this neighbourhood at this point in time!!!! Thanks for filling me in on the AGM date. I’m a member of Vancity myself, and will certainly attend the meeting and bring this up as well. For full disclosure, I work in same tech industry this projected is targeted for, so I might have a bias here. Yes we have housing affordability crisis in the city, but there are other factor to be consider. Vancouver needs office space for attract these companies, I don’t even think there an argument there, so the more important question is “where?” else. The article is only addresses the affordability as a factor, but there are other important factors that need to be considered. How about connectivity (access to public transport) for another. At my previous companies, people (any company acquired by my company) simply refused to move to existing purpose build bigger office because they didn’t want to move to downtown. Reason this place was consider to be in the middle of nowhere (this is same area where among other Sage, Sierra Wireless, AeroInfo has there office), the public transport was very infrequent (30 mins peak, 1 hour off peak), only 2 place to eat nearby (a bread garden and a small independent cafe). It was likely very hard to convince new candidates to accept new offers, (they said they will need car for pay should be higher, plus with compute time a 9 hours work day become 10 hours). We eventually close the facility and moved to 2 tiny offices in downtown, with no room for growth as space didn’t have space. But I too have concern about how city plans to give it out startups. What are the profits the operators are going to take away. What stops them for favoring bigger companies that can afford to pay more over startup with likely no money at all in the beginning. What happens when the company takes off the ground, how and where will they move, and what is stop them to moving to another city. There are all very all serious concerns. But sorry on this one I’m with the city. Connectivity and affordable places to eat is also precisely why the DTES is essential to the low-income community. It also contains the only affordable housing in the city as well as other essential amenities and services for the low-income community. Not to mention the sense of community and belonging that many of its residence feel to the area. It is one of the few, if not the only area in the city that remains affordable to people on welfare and low-incomes. The proposed Technology Centre is a direct threat to the all of the above. If the City seriously addressed affordability, for example, by implementing rent regulation, regulating speculation and actually building social housing – the question “where else” would not have to be asked and new offices would not have to come at the cost of existing housing. The city would be more affordable for people (most importantly) but also for offices etc. I share your sentiments but it would help me understand better if you can give an alternative plan of where and how to establish such a facility, or some concrete strategy. Sorry to say but I hear a lot of buzz words (rent regulation and regulating speculation) in your reply, but not an actionable suggestion and numbers to back it up. I would oppose any condo or a generic mixed used building in the area, but it’s hard to justify my opposition for office space. Unlike “incubation,” “acceleration” and other inventions of the “creative economy”, terms like rent regulation and speculation control are not buzz words. Rent regulation is a regulation that the province can impose and has done before in BC’s history. The effects are straightforward: it dampens speculation on people’s homes, lowers landlords profit margins, and it makes living more affordable for the people (and businesses) of the province. And aren’t rents already capped at inflation rate plus 2% per year? Btw, still not a concrete proposal on where to put new offices. Doesn’t this space already exist? It’s called W2. But the City locked the doors because W2 did not have the finances to pay the building fees! Why doesn’t the City pay the fees for W2 and keep the Digital Strategy moving forward? Could it be because W2 was managed by the community and not a private interest?